Fleets in Nottingham are being offered funding support, advice and free vehicle trials in a new initiative to encourage the transition to ultra-low emission vehicles. 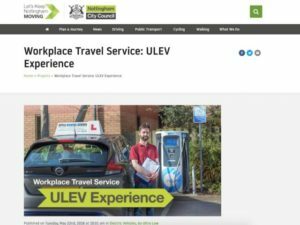 The ‘Workplace Travel Service: ULEV Experience’ programme (see intro video here) is funded by Nottingham City Council’s Go Ultra Low City project and is targeted at local businesses and public sector organisations to help them understand the true potential of ULEVs. The first event under the initiative took place last week (Friday 22 June) at Nottingham Racecourse and enabled attendees to find out about the latest ULEVs available – including test drives – as well as outlining the business case for transitioning to ULEVs, the funding support available from central government and through Nottingham City Council’s Workplace Travel Service, and Nottingham’s investment in charging infrastructure. Under the programme – delivered by a consortium led by Cenex, with partners from Automotive Comms, CleanTech Business, DriveElectric, Energy Saving Trust and The Big Wheel, fleets can also benefit from fully funded fleet reviews, worth up to £11,000, helping a business to understand if low emission vehicle technology is right for them, and Low Emission Vehicle Loans with over 20 different makes and models available to try for up to one month. Future events will further help organisations to learn more about ULEVs and identify if there are any benefits for the business. The ULEV experience website also features a free journey planner and public transport details.